Figuring out the age of your hamster is a little trickier than asking for his driver's license. Hamsters age quickly and live relatively short lives -- sometimes less than three years -- so unless he's near the beginning or the end, the best you can do is guess. Still, by reading the clues that he's particularly young or particularly old, you can figure out if he's near the beginning, the middle or the end of his time with you. Check the eyes and ears. 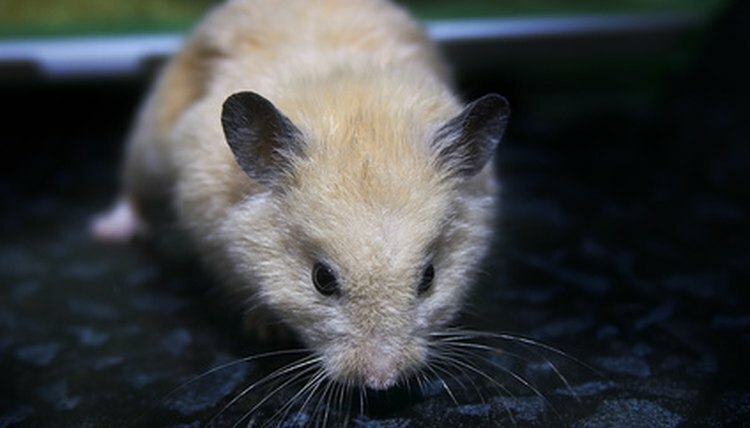 While different breeds of hamsters exist, the way each ages is similar. If your hamster's ears are shut, he's less than a week old. If his eyes won't yet open, he's likely no older than 2 weeks or so. Watch his habits if he still lives with his mother. While a hamster can start eating solids once he's about a week old, he may continue suckling for up to a month. Monitor his fur. At the age of 1, a hamster is considered middle-aged. Like certain two-legged middle-aged mammals, he might experience thinning hair that continues to thin until his eventual death. If his hair appears to remain a steady length, he is probably less than a year old or close to a year old. When it begins to progressively thin out, he's over the hill. Watch his habits as time goes on. If he is lethargic and no longer shows interest in treats or exercise, or if his weight fluctuates, he's likely toward the end of his life.  While you can estimate his age on your own, you should be taking your hamster to see a vet for checkups anyway -- ask your veterinarian for a professional assessment. What Turtles Have Orange & Black Bodies?